After small amounts of contaminants were found at the town's fill pile on Richard White Way, the site was shut down temporarily. Julian Enterprises, which ran the site until last December, was expected to be allowed to remove its equipment on Jan. 18. FAIRFIELD — The fill pile at Richard White Way, once an eyesore for neighbors, has also been a focus of a police investigation for the past year and half. “On July 5, 2017, we launched a criminal investigation into allegations of misconduct at the ‘fill pile’ which is currently ongoing, open and active,” newly appointed Police Chief Chris Lyddy told the Citizen. 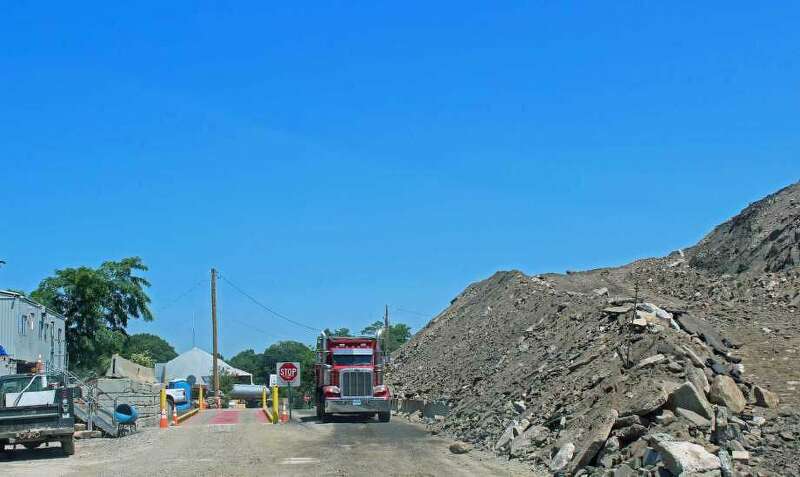 Complaints from civilians about the volume of material at the fill pile and the “excessive truck traffic traveling in the beach area” at the time prompted the investigation, Lyddy said. While not providing specifics as the investigation is ongoing, Lyddy confirmed the probe included Julian Enterprises, the company awarded a bid by the town through the Public Works Department in May 2013 to reduce the stockpile at the site. However, Lyddy would not comment on whether the investigation included town departments. “The town has defamed our clients and we intend on pursuing our claim for damages,” Thomas Cotter said, referencing the active lawsuit the company filed against the town in 2017. Town Attorney Stanton Lesser and Director of Public Works Joe Michelangelo declined to comment, and Superintendent of Public Works Scott Bartlett did not respond to requests for comment. If the investigation merits probable clause, a warrant application will be submitted to the State’s Attorney’s Office for review, Lyddy said. John Smriga, the state attorney for the Fairfield Judicial District, said he could not comment on a pending investigation. In the latest turn of events, on Jan. 28, the town filed a motion to restore its lawsuit against Julian to the judicial docket, claiming Julian hasn’t cooperated in the process prior to a scheduled arbitration hearing. “From the inception, Defendants (Julian) have either rejected or shown complete indifference to the arbitration process,” the motion reads. The file reads that Julian has failed to sign a requisite contract with the arbitrator, ignored discovery commitments and has continued to delay the arbitration hearing originally scheduled for Feb. 13-15 at the offices of Cohen and Wolf, a Bridgeport-based law firm. “We are requesting the matter proceed to trial,” Tetreau said. Thomas Cotter disputed the town’s claims. “Julian had made available to the town and their attorneys thousands of documents, the town has yet to turn anything over to us. If they want to go back to court, we’re happy to go back to court,” Thomas Cotter said. The legal saga dates back to May 2017 when the town sued Julian claiming breach of contract when the fill pile the company was hired to reduce nearly tripled in total height and volume from 2013 to 2016. In mid-November of last year, both parties agreed to withdraw their lawsuits and go into an arbitration hearing, a typically private event. The decision concerned members of the Board of Finance and some selectmen who called for public updates from Tetreau and Lesser. Selectmen Ed Bateson and Chris Tymniak, in a Dec. 21 memo obtained as part of a Freedom of Information request, objected to the withdrawal, arguing only the Board of Selectmen, not the First Selectman alone, can direct action on legal matters per the town charter. “To proceed further without the authorization of the Board of Selectmen is reckless and potentially harmful to the town,” the memo reads.